The Captain America BBQ Tool Set is the perfect gift to say thanks to the hero of the grill. 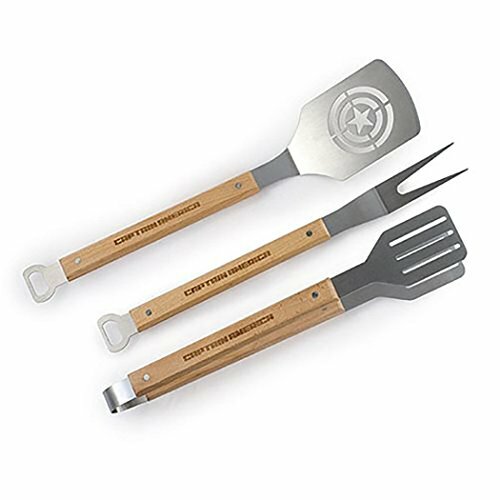 This three piece set that includes a logo grilling spatula with an offset handle and a bottle opener in the handle, a grilling fork with another bottle opener in the handle, and a pair of long-handled slotted tongs. Now the pit-master at your next cookout will be ready for saving the world and burger flipping. Hand wash only. Not dishwasher safe. Includes a logo grilling spatula with an offset handle, a grilling fork, and a pair of long-handled slotted tongs. If you have any questions about this product by Captain America, contact us by completing and submitting the form below. If you are looking for a specif part number, please include it with your message.